And then there are odd days when I am left thinking and wondering about most unusual or even weird things… Like yesterday when this thought surfaced on my otherwise sane mind! If you are to compare yourself (your personality) to some vegetable, which one will it be? I think I am like Garlic or Onion. No, not stinky but made up of tight, complex layers… You either love it or hate it and I guess in many ways my personality is very much like that. People who know me really well love me with all my faults and mind you, there are not many who know me well. Not because I am a snob or person with head weight as many like to label me, but because I am quite shy and stay away from lime light as much as I can. I am someone whom you will see surrounded by many friends, but in reality there are only few good friends who know me quite well. Throw me in a room filled with people and you will see me sitting in a quiet corner with a drink and a book in hand lost in my own world. If one has to initiate the talk, there is very little chance of it being me as I find it quite uncomfortable to introduce myself and initiate talks. The mere idea of conversing with random strangers makes me queasy and my short talks are always punctuated with uncomfortable silence and awkward gaps which I find hard to fill. Thankfully this lack of social skill is not extended to my work life where it involves talking to people to gather information and work with different people with different skill sets. But when I have to meet the same people outside work, I again find myself in a difficult situation to talk openly about myself and my family. And then throw me in a room filled with my family, friends and the people whom I know and love/like dearly. Surprisingly you will find all the spotlights glaring at me as I move around laughing and holding long conversations with ease. At any other place I would be tagged as a boring person in the background, but here with my loved ones I see myself transforming into quite interesting creature who can talk and discuss about anything and everything under sun! And there is one other place where I hold long conversations with every stranger who happens to pass by and that place is called Monsoon Spice. Yes, I am talking about my blog where I can ‘talk’ at stretch and share every smallest nugget of my life! This is one other place where I speak my mind and open my heart. It must be to do with a fact that I can be anonymous, just a boring person in the background, and also the fact that there is no pressure to talk about just politically correct things! In fact, I really like the fact there is no pressure to even talk… I can write about anything and everything and post it anytime I want! I don’t have to worry about random strangers judging me just after hearing me speak few words or even before I open my mouth! May be that is the reason why not many in family and friend circle know about my blog :) After blogging for 6+ years, I still love to come to this virtual world and rant and ramble. All these years of blogging, I have come across hundreds of bloggers but there is only handful of bloggers whom I call my friends and I haven’t met even one of them in real world! But I do hope that day will come when I will be able to meet them in person, face to face; but for now the emails we exchange and the online chats in the social networking sites are enough to keep me content. One other thing that keeps me content is food; currently it is the warm foods on cold winter nights! 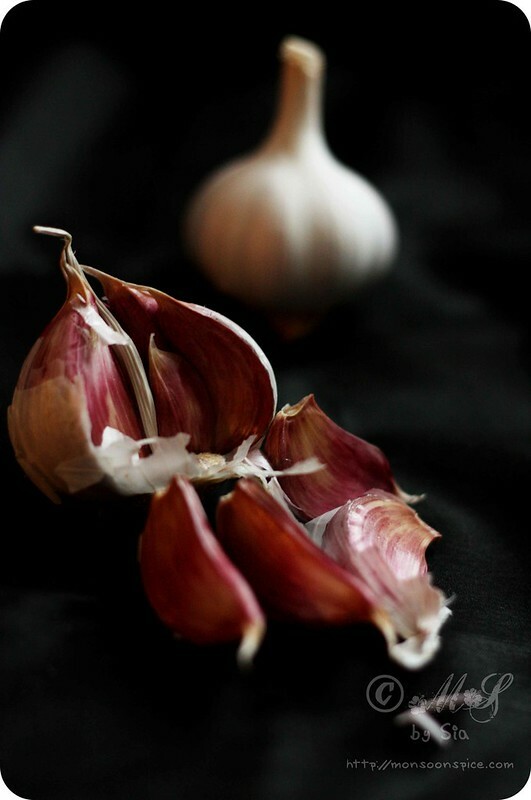 Since we started this post with onions and garlic, today’s recipe has them both, in plenty! I have talked about my love for Indo-Chinese food over the years. 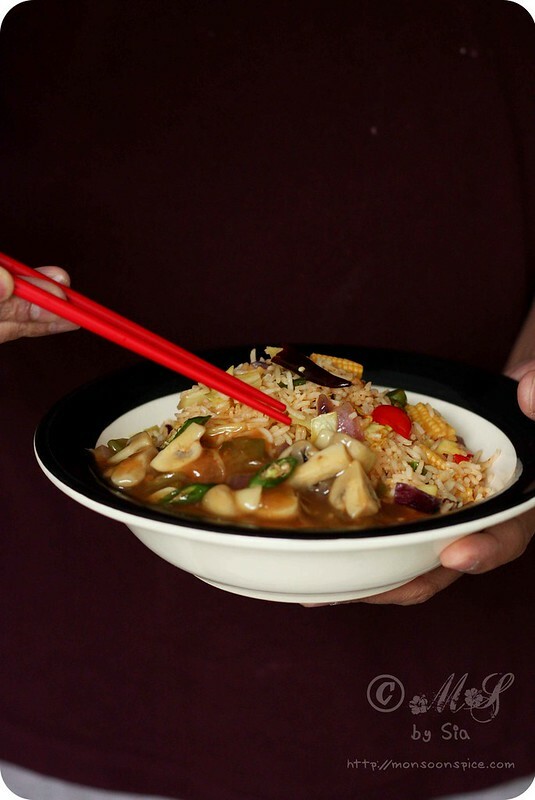 For those who prefer authentic Chinese fair, you can close the window right now as we are combining the bold, knock-your-socks-off Indian flavours with subtle, well balanced Zen like Chinese cuisine. Indo-Chinese cuisine is probably the second most loved food in India, right after the local fair. 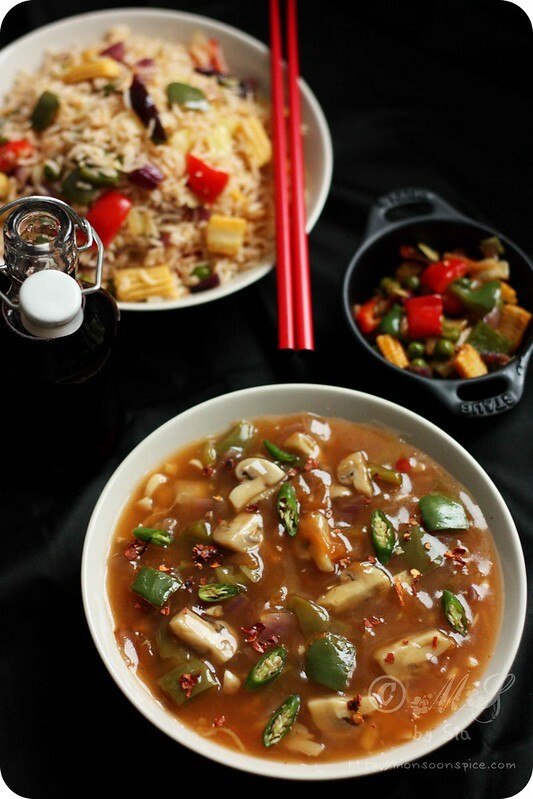 Every Indian who has left the home and landed in western countries gets a major shock of their life when they taste the real Chinese food which is so much different to eye-popping spicy Chinese food that they grew up eating and loving! Well, I got mine when my colleagues took me out for Chinese lunch for my welcome dinner. My taste buds were confused when they met the mild, yin-yang Chinese food and frankly they were disappointed after years of wolfing down the Indo-Chinese fair! That’s when I started cooking Indo-Chinese at home to satisfy my cravings for the pseudo Chinese food I grew up eating without following any recipes but just by remembering the taste! Little did I know that I would create a hungry monster in the form of DH who turned out be bigger admirer of Indo-Chinese food than me! Cutting the long story short, these days I make sure to cook in bulk as we both don’t mind eating the same stuff for lunch and dinner for 2-3 consecutive days or until the last spoonful is licked clean! Today’s recipe for Mushrooms in Garlic Sauce is a beautiful example of how subtle and mild Chinese cooking gets a new avatar when fiery hot Indian flavours are added. This Mushrooms in Garlic Sauce recipe is very simple and quick to make when you have some friends visiting you and you want to cook something that will not take a lot of your time. 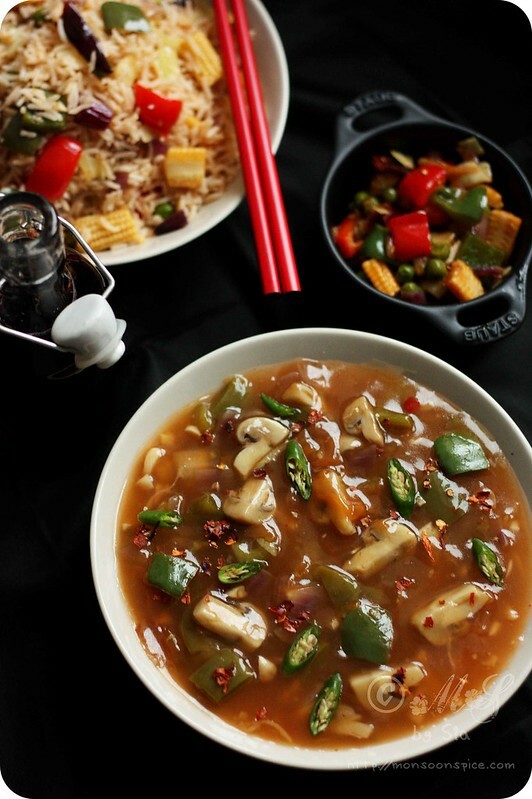 I have added a bell pepper to elevate the taste by its peppery flavour and feel free to add any other vegetables of your choice like thin fingers of carrots, baby corn, bamboo shoots, water chestnuts, green peas or shredded carrots. 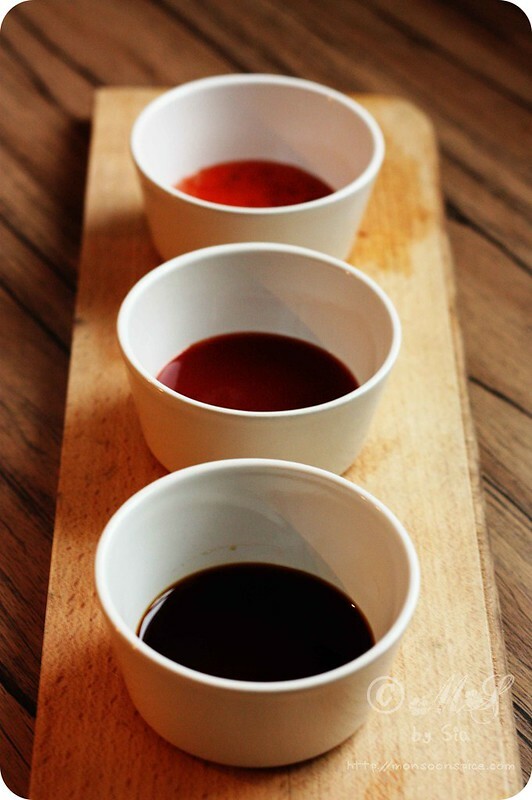 Just remember to taste the dish before adding salt as the soya sauce has some salt in it. 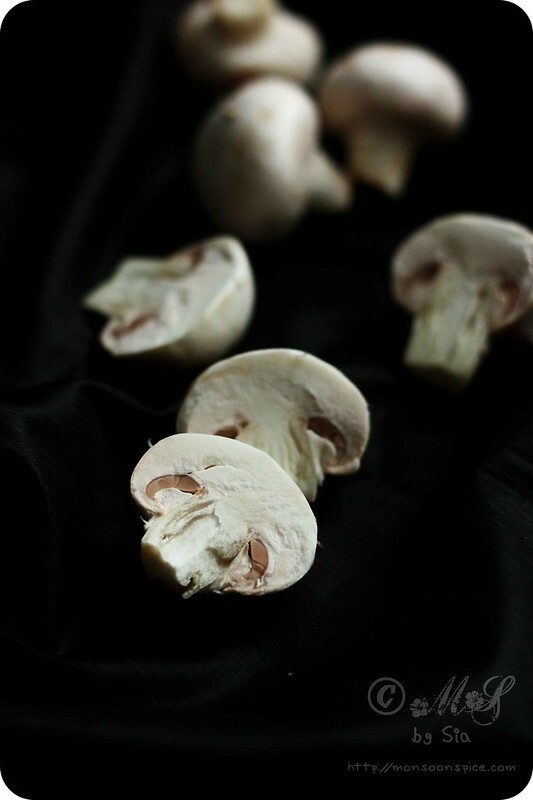 I usually pair this Mushrooms in Garlic Sauce with Veg Fried Rice or Schezwan Fried Rice or Noodles. 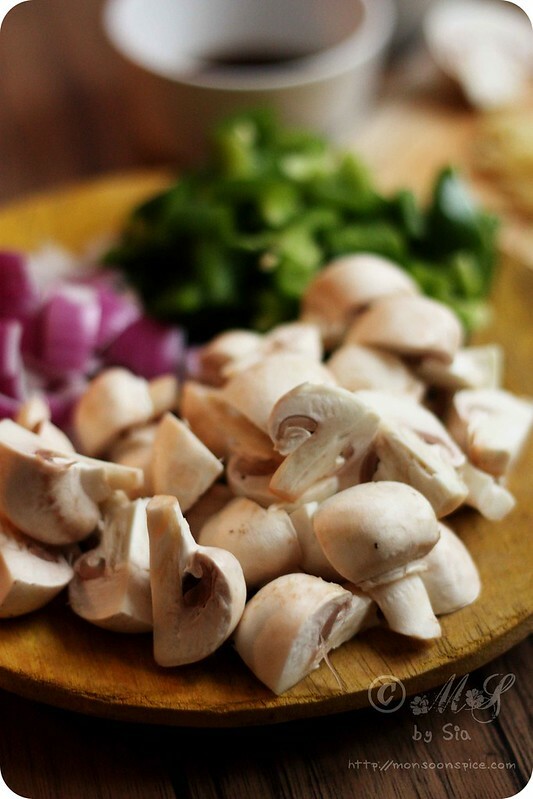 The Mushrooms in Garlic Sauce can also be served a soup by reducing the corn flour used or by increasing the amount of water to make it little thinner. 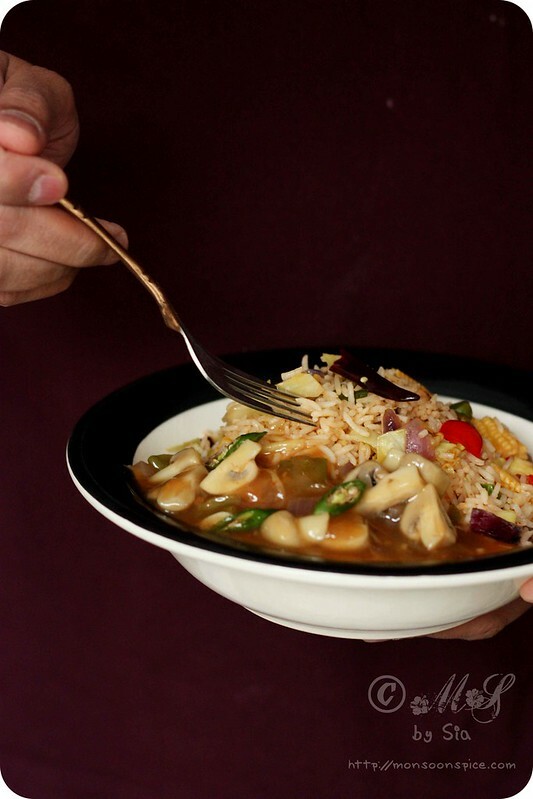 Oh the possibilities are endless to enjoy this piping hot bowl of goodness on a cold and wet winter nights. Dissolve corn flour in ½ cup of water and keep it aside until needed. Heat oil in a pan to smoking hot and add finely chopped garlic and green chillies. Give it a quick stir for half a minute and add diced onions. Stir fry the onions on high heat for a minute or two till the edges start to brown. 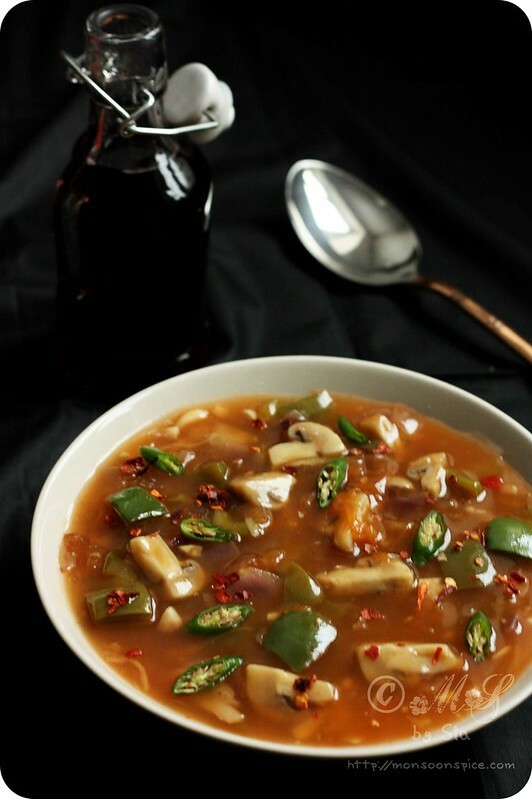 Mix in diced bell pepper along with finely chopped ginger and stir fry for a minute or two on high flame. 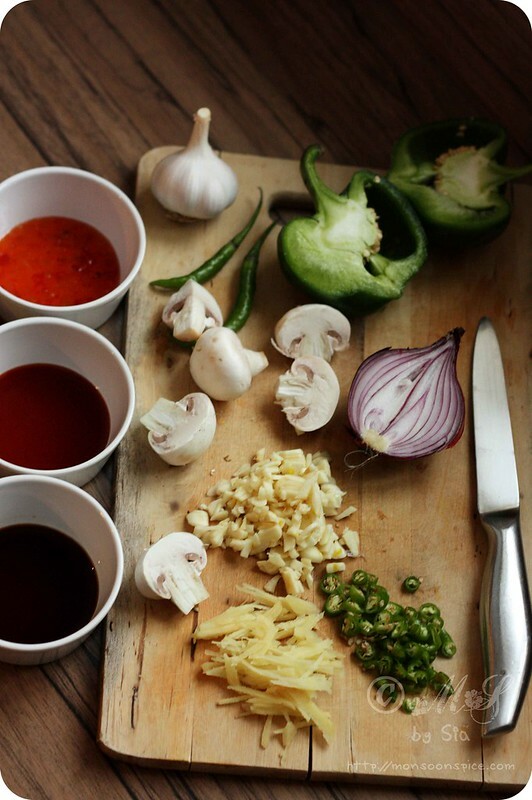 Add mushrooms along with soya sauce, red chilli sauce and sweet chilli sauce and stir fry for 2 minutes on high flame. Next pour 4-5 cups of water and mix in palm sugar and salt to taste. Reduce the heat to medium and let it cook for 6-7 minutes. Once the mushrooms are cooked through, add the corn flour dissolved in water little at a time while you continue to stir the gravy to avoid from forming lumps. Once all the corn starch is added, the gravy will start to thicken. Let it cook for 3-5 minutes on medium heat. Add freshly ground pepper corns and mix them well. Turn off the heat and let it rest for 5-10 minutes for all the flavours to blend well. 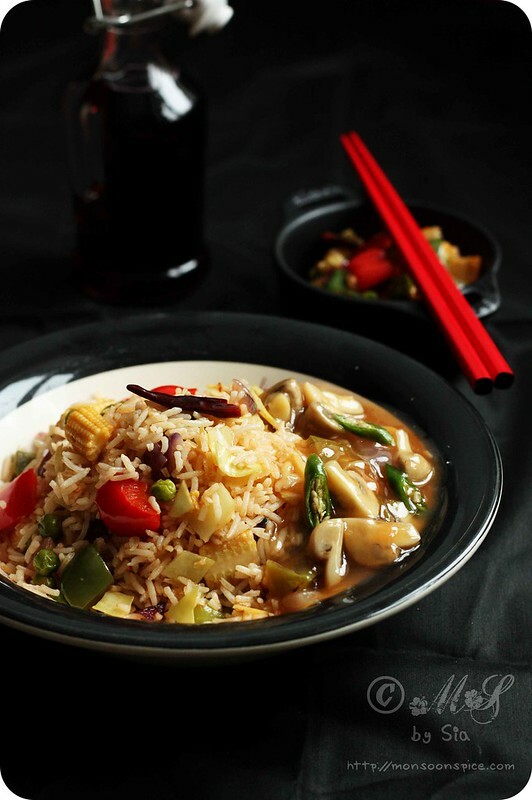 Serve this delicious Mushroom in Garlic Sauce with any Indo-Chinese Fried Rice or Noodles. Enjoy! 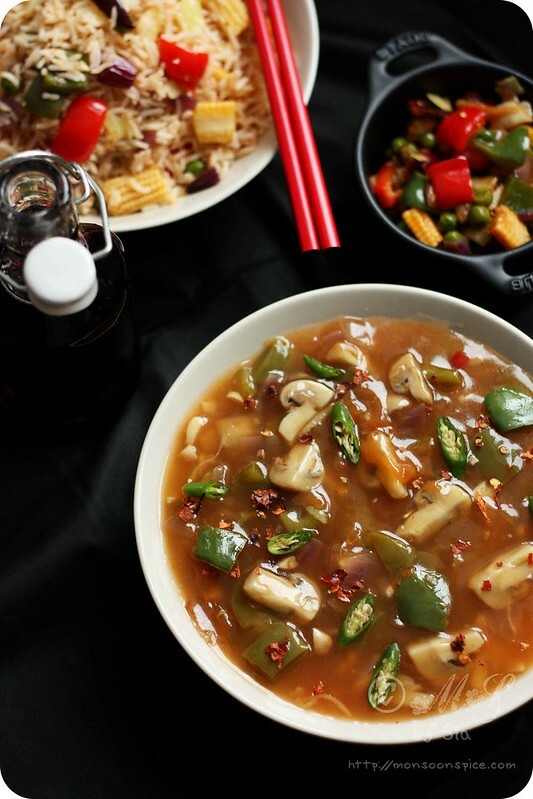 I have added a bell pepper to elevate the taste by its peppery flavour and feel free to add any other vegetables of your choice like thin fingers of carrots, baby corn, bamboo shoots, water chestnuts, green peas or shredded carrots. Remember to taste the dish before adding salt as the soya sauce has some salt in it. If you find the gravy too thin, add ½ - 1 tbsp of corn flour/starch dissolved in ¼ cup of water. And similarly add little more water if you find the gravy too thick. I usually pair this Mushrooms in Garlic Sauce with Veg Fried Rice or Schezwan Fried Rice or Noodles. 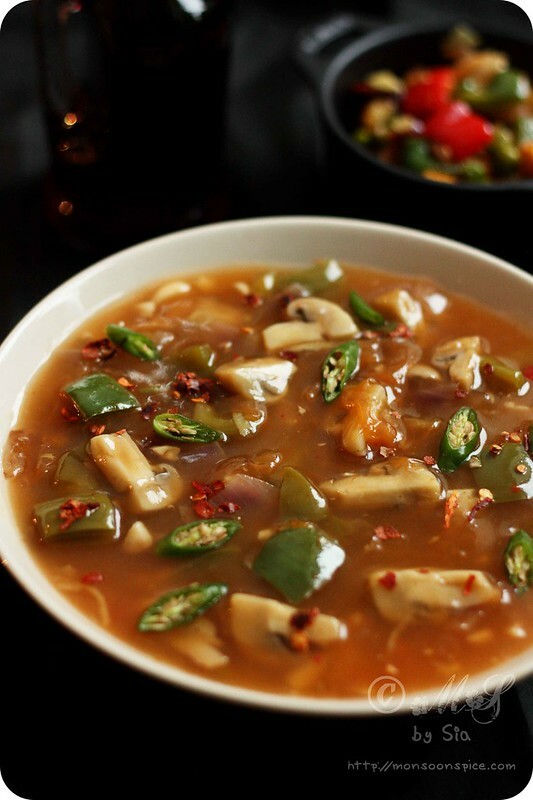 The Mushrooms in Garlic Sauce can also be served a soup by reducing the corn flour used or by increasing the amount of water to make it little thin. awesome. the pics as well as the post. loved the red chopsticks. yummy delicious and lip smacking dish. 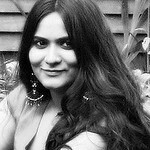 u are in a happy place by not meeting anyone and having a nice and friendly relation with many... no doubts we are blessed to have our own places where we dont need to worry what why and when do we rant... dont we love reading each other... loved each and every pic yaar... beautiful.. i love everything indo chinese.. people know swati will either eat palak paneer with naan when out or something indo chinese... and i love mushrooms in garlic sauce..
Lovely post and recipe! I will definitely be making this soon. Just can't get enough of Indo-Chinese cuisine! Reading your space brings back so many memories! I love coming here to listen to you speak as you have so many wonderful memories to share. And then the delicious food here makes me hungry whenever I see them! I love Mushrooms.. Just a question I am not sure if I have seen sweet chilli sauce! Any substitutes? Thanks for this wonderful recipe. I did a similar one with Tofu and served it with fried rice. Its an instant hit. We are going to make this on a regular basis. Yumm dish!